Bit By Bit, Afghanistan Rebuilds Buddhist Statues The Taliban destroyed the historic statues a decade ago. But in a painstaking process, the two giant carvings of Buddha are being reconstructed on the side of a cliff in central Afghanistan. 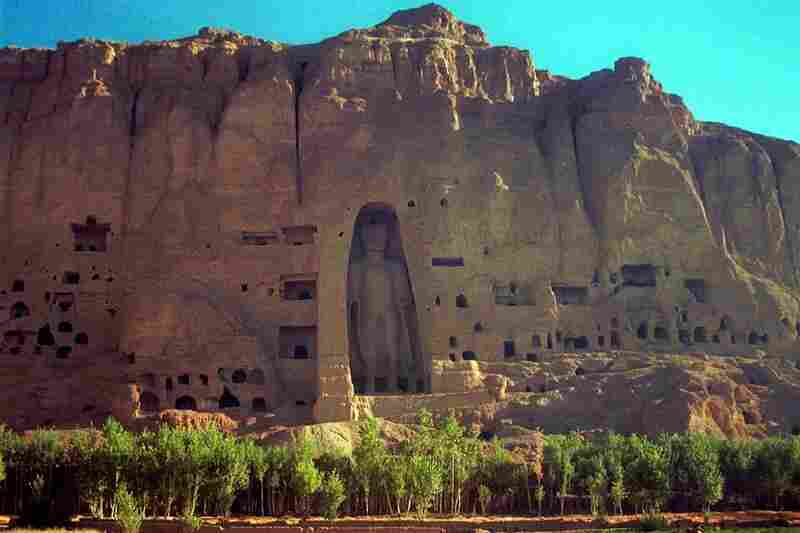 The larger of the two Buddha statues that towered over the Bamiyan Valley in central Afghanistan. This photo was taken before a 2001 Taliban campaign that destroyed Buddha statues throughout Afghanistan. International teams are now working to restore the sixth century statues. 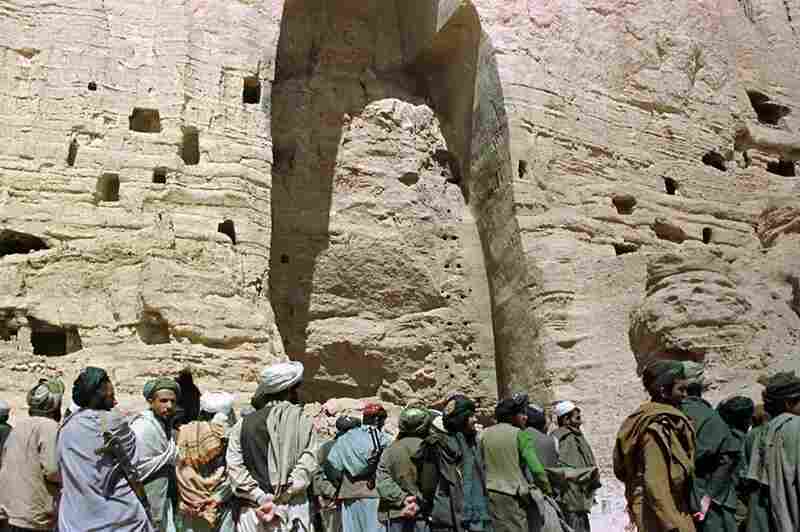 Taliban soldiers stand at the base of a mountain alcove under one of the destroyed Buddha statues in March 2001. 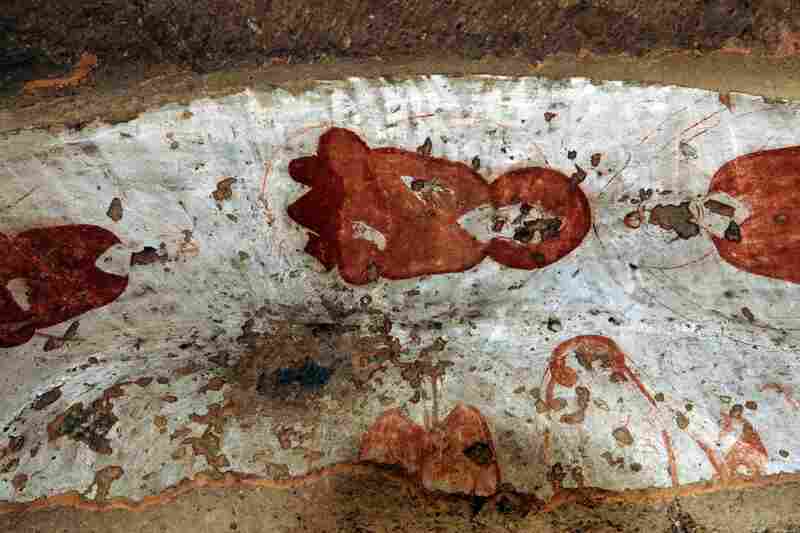 Damaged paintings at the top of the cave's entrance are shown in 2008. Afghan girls walk past scaffolding at the site of one of the destroyed Buddha statues in this 2008 photo. Some Bamiyan residents support the restoration project. Others say the statues should not be rebuilt, to remind people of the Taliban's fanaticism. 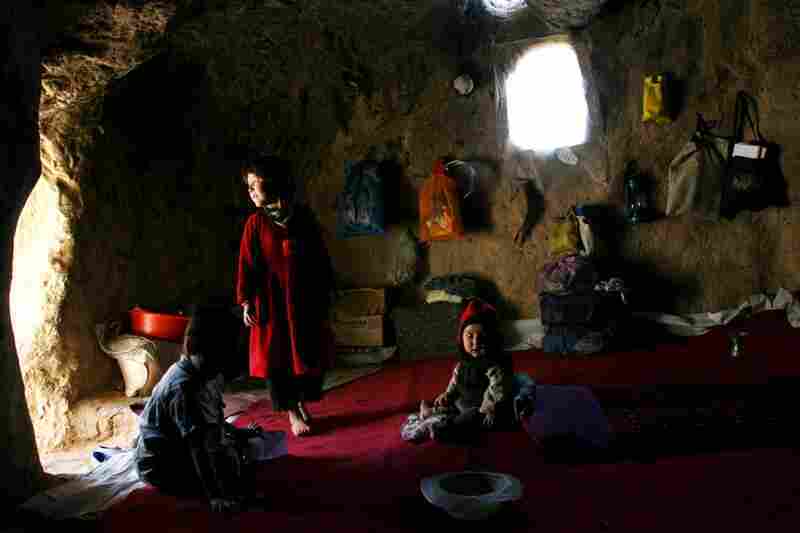 Afghan children living in a small cave near the destroyed Buddha statues, in 2006. Homeless people in the area sometimes move into the caves. They say that new homes are more important than restoring the Buddhas. Workers remove pieces of one of the destroyed Buddha statues in September 2005. The United Nations is spearheading the multimillion-dollar restoration project. When the Taliban controlled Afghanistan a decade ago, they were fanatical about eliminating everything they considered un-Islamic. Their biggest targets — literally and figuratively — were the two monumental Buddha statues carved out of the sandstone cliffs in central Afghanistan. One stood nearly 180 feet tall and the other about 120 feet high, and together they had watched over the dusty Bamiyan Valley since the sixth century, several centuries before Islam reached the region. Despite international opposition, the Taliban destroyed the statues with massive explosions in 2001. At the time they were blown up, the statues were the largest Buddha carvings in the world, and it seemed they were gone for good. But today, teams from the United Nations Educational, Scientific and Cultural Organization, along with the International Council on Monuments and Sites, are engaged in the painstaking process of putting the broken Buddhas back together. Up to half of the Buddha pieces can be recovered, according to Bert Praxenthaler, a German art historian and sculptor, who has been working at the site for the past eight years. He and his crew have sifted through 400 tons of rubble and have recovered many parts of the statues along with shrapnel, land mines and explosives that were used in their demolition. But how do you rebuild the Buddhas from the rubble? "The archaeological term is 'anastylosis,' but most people think it's some kind of strange disease," said Praxenthaler. For those in the archaeology world, "anastylosis" is actually a familiar term. It was the process used to restore the Parthenon of Athens. It involves combining the monument's original pieces with modern material. On a recent day, Praxenthaler was leading a group through a tunnel behind the niche where the smaller of the two statues once stood. "We are now on top of the Buddha," he explained. "There was just a wall and a small opening to sit on the top, or the head, of the Buddha. But now there is no head." The workers were busy removing scaffolding after months spent reinforcing the wall where the Buddha's head once was. Bamiyan is an extremely poor and remote land in one of the world's most underdeveloped countries. The Buddha statues were once a major tourist attraction, but Afghanistan has been at war virtually nonstop for more than three decades. The fighting drove away the tourists years before the Taliban blew up the statues. The restoration project is designed to rebuild the historic site, as well as bring back the tourists. The project has the support of Habiba Sarabi, the popular provincial governor. And there are reasons to be hopeful. Bamiyan is now considered one of the less dangerous places in Afghanistan. Yet others, like human rights activist Abdullah Hamadi, say the empty niches where the Buddhas stood are a reminder of the Taliban's fanaticism, and should be left as they are. Hamadi is from the nearby district of Yakawlang, where the Taliban massacred more than 300 members of a minority group, called the Hazaras, in 2001. Those killings took place just two months before the Taliban blew up the Buddha statues. While Bamiyan is much safer today, the Taliban can still strike. Recently, Taliban insurgents kidnapped and beheaded Jawad Zahak, the head of the Bamiyan provincial council, while he was driving his family toward Kabul, about 150 miles to the southeast. Some in Bamiyan say they would rather see the money for the restoration project go toward services like electricity and housing, which are in desperately short supply. 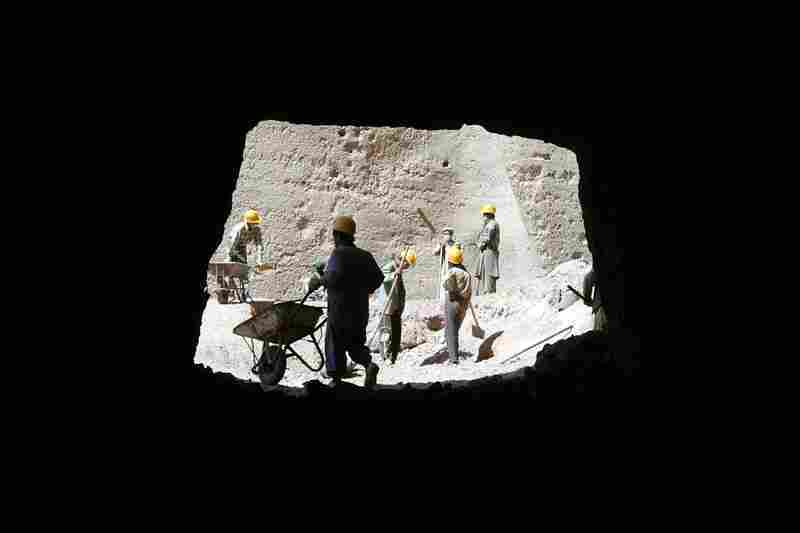 In fact, the caves at the site of the Buddha statues are the only shelter some Bamiyan residents can find. Homeless villagers like Marzia and her six children are living in one of the caves, while the family's goats bleat nearby. Marzia, who like many Afghans uses only one name, said she has no use for the statues. "We don't have a house, so where else can we live?" she said. A few enterprising villagers have found ways to make money off the story surrounding the Buddhas. One is Said Merza Husain, known around town as the man who was forced to help the Taliban blow up the statues. He said he had no choice but to obey the Taliban a decade ago. If he had resisted, they would have killed him. One of his friends refused to take part, and the Taliban shot him. But that is the only information Husain will share for free. To hear more of the story, he charges anywhere between $20 and $100. Meanwhile, Bert Praxenthaler's team was about to halt their work temporarily during the scorching Afghan summer. One longtime worker, Ali Reza, was picking up his pay. He signed his name and received a wad of Afghanis. Praxenthaler also handed him a certificate and thanked him first in Dari, then in English. 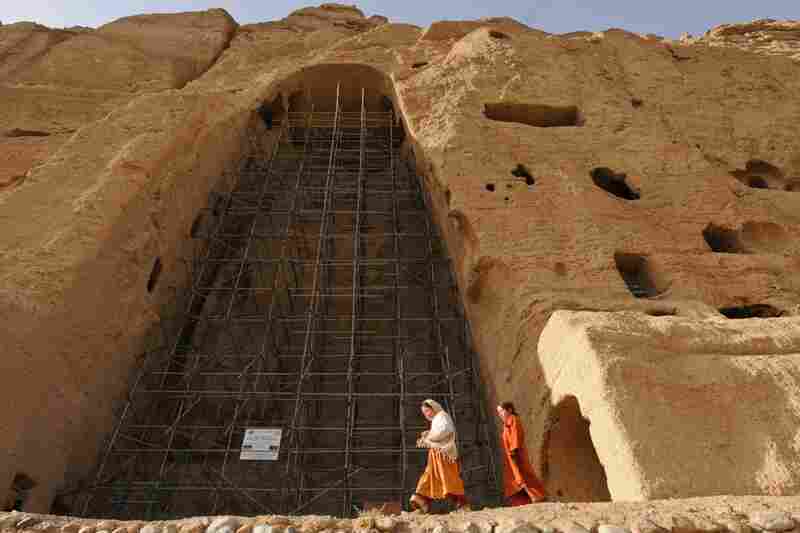 Piecing together Bamiyan's Buddhas will take many more years. After a summer break, Praxenthaler's team plans to resume their work in the fall. This story was partly funded by a Knight Luce Fellowship for Reporting on Global Religion.